Our services are directed towards leaders that have innovation as a top priority. If you are an innovation director or manager, a project leader, or a CIO (Chief Innovation Officer), our services will be of interest to you: We can help you deliver on the promise of innovation. Innovation Projects: Take a deep dive into innovation, either by creating an Innovation Strategy, embarking on a 20 week FORTH Innovation Expedition, an Innovation Culture Project, or an Intensive 2-day Innovation Camp. Through Innovation Projects, we guarantee that you will get innovation results – our methods are systematic, structured, and rooted in the latest innovation knowledge. 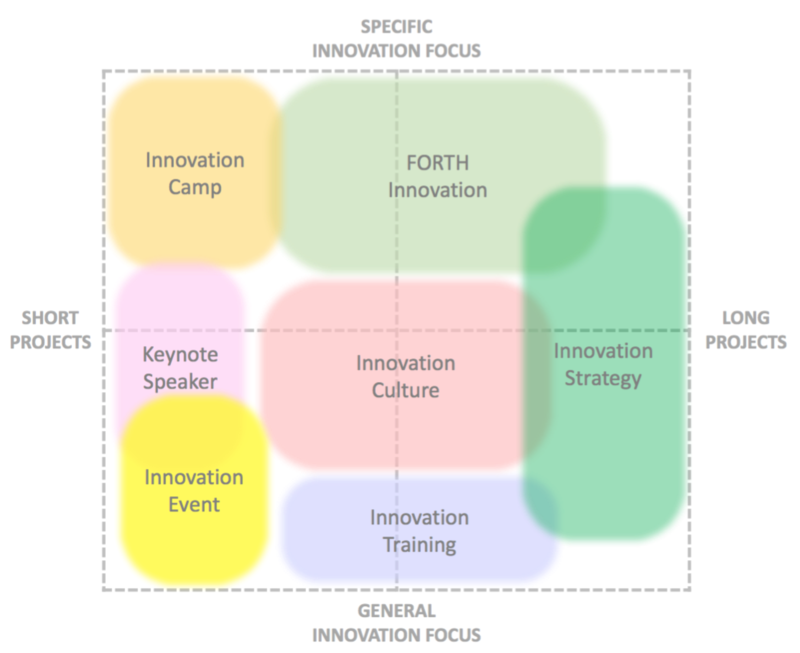 Innovation Events: Through seminars, workshops, or conferences we design and facilitate innovation activities, either to generate lots of ideas through very systematic ideation sessions, or to discuss innovation challenges in small or large groups. Innovation Knowledge: Get the latest insights into innovation practices and methods, by hiring Finn as keynote speaker, or through innovation training. We adjust to your need: From a one-hour keynote speech to a full-fledged innovation project. We meet you where you are: From basic innovation training to executive innovation coaching. We help you become self-made: A self-made and rough innovation method will most often be much more efficient than a smooth off-the-shelf method. We guarantee results: Through our systematic approach, we guarantee that you will get tangible innovation out of working with us.